By Dan Ambrose: Former IBF welterweight champion Shawn Porter doesn’t think that former IBF/WBC welterweight champion Andre Berto (30-3, 23 KOs) is the same fighter that he once was years ago, and for that reason Porter believes that Floyd Mayweather Jr. (48-0, 26 KOs) will defeat him in their fight in a little over a month from now on September 12th on Showtime pay-per-view from the MGM Grand in Las Vegas, Nevada. Berto is a tremendous underdog with the odds-makers, with many of them seeing Mayweather as a 40:1 favorite in the fight. That doesn’t mean that Berto has no chance of winning, because he still has good punching power and hand speed. But the fact that he’s lost 3 out of his last 6 fights is hard to ignore when predicting the outcome in his clash with Mayweather. Unless Berto lands something big at some point in the fight to hurt Mayweather, he’s likely going to lose and lose big. Mayweather has made himself look bad by selecting Berto for this fight because you’re not seeing other top fighters like Manny Pacquiao or Kell Brook taking on such an obvious soft job like Mayweather is for this fight. Porter is off on his timeline when saying that Berto hasn’t looked good in the last three years. Berto hasn’t looked good in the last five years since he stopped Freddy Hernandez in the 1st round in 2010. That was last time that Berto really shined in a fight. He was beaten by Victor Ortiz in 2011. Berto rebounded from that loss to defeat Jan, but that was a short lived thing. Porter feels that he’d do a lot better job against Mayweather than Berto, and he probably would if given the chance. But it’s pretty clear that Mayweather is being very selective in who he faces at this point in his career. If he does fight beyond the Berto fight in 2016, it’s probably not going to be against Porter. If Mayweather fights in 2016, you can bet it’ll be one of the big three: Manny Pacquiao, Saul “Canelo” Alvarez or Miguel Cotto. Mayweather isn’t going to doing anything heroic like face Gennady Golovkin, Porter, Keith Thurman, Miguel Cotto or Kell Brook. Those would be fights that would win Mayweather respect from the fans, but I believe that Mayweather will be thinking about his bottom line when/if he does get back inside the ring next year. He’ll be focusing on facing fighters that can bring a lot to the table in terms of pay per view buys, and Cotto, Canelo or Pacquiao bring the most money with a manageable risk that Mayweather can handle. Brook, Porter, Khan, Thurman or Golovkin are all risky fights for Mayweather because they have fighting styles that Mayweather might have problems with if he were to accept a fight with one or more of them. Since Mayweather seems to be concerned with keeping his unbeaten record intact, I don’t know if he’s going to be willing to risk it against one of those young lions. If Porter was a top name back earlier in Mayweather’s career like Berto was, then perhaps he’d be getting the fight against Mayweather on September 12th. 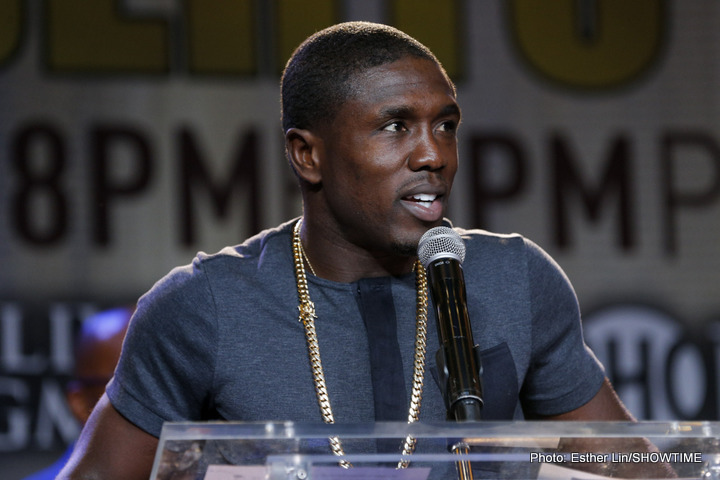 Berto seems to have been picked out by Mayweather because he was one of the top guys from years ago when Mayweather and Berto were seen as the top fighters in the welterweight division. This is before Pacquiao moved up in weight to the 147lb division. Mayweather was supposed to fight Berto many years ago, but the fight failed to materialize, which isn’t surprising because there were a lot of top welterweights that Mayweather never fought like Paul Williams and Antonio Margarito to name a couple. “He’s tailor-made for me,” said Porter about Danny Garcia. Porter would like to face former WBA/WBC light welterweight champion Danny Garcia, who recently moved up to the full weight for the welterweight division this month in his fight against Paulie Malignaggi. That’s a fight that Porter would have a very good chance of winning if he could deal with whatever tricks that Garcia had up his sleeves for the fight.